Immigration is a current issue. Our country, Canada, is made up of emigrants; at least 200,000 people from different parts of the world join Canada every year. My experience with emigrants at Braeside EMC and Aberdeen EMC allowed me to know their stories that seemed far away; however, the experience of these days have brought me closer to those stories. Emigrating is not always easy. The reasons are different, the stories too. These days I was volunteering with FM4 (fm4pasolibre.org), a civil organization in Guadalajara that helps migrants. On Saturday, Nov. 10, 2018, at night migrants began arriving in the city. On Sunday I got a message to go to a shelter and oversee the collection centre. Many people brought water, food, clothes, hygiene supplies, backpacks, and shoes. The collection centre was at the entrance, so I had the opportunity to welcome migrants at their arriving. 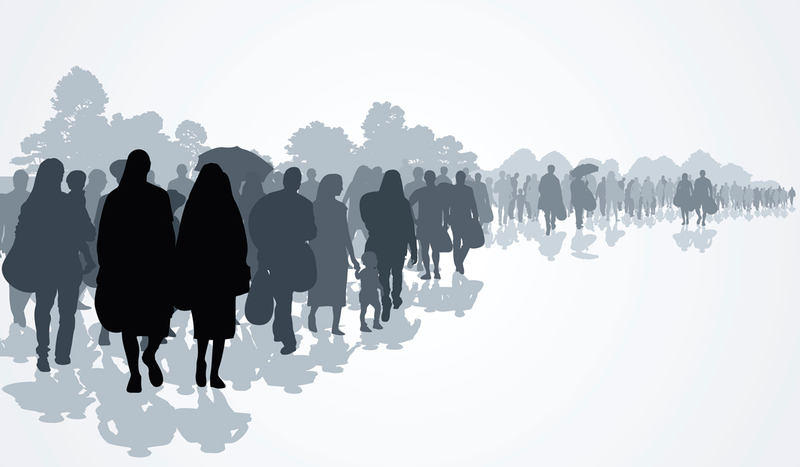 A thousand immigrants arrived on Sunday by walking. They came from Honduras, Nicaragua, El Salvador, and Guatemala. Two of main factors they flee their countries are violence and poverty. The “Caravana” crossed the Guatemala-Mexican border a month ago on their way north. On Monday night more than 5,000 reached Guadalajara. The shelter and help collapsed. As soon the sun came up on Tuesday, a group of migrants decided to continue their journey; soon the whole group followed them. The road covered with people seems like an exodus. They looked weary, sad. Parents pushing strollers. People carrying all their belongings in backpacks; and they kept walking and walking. The image seemed surreal and heartbreaking. With my van empty I went onto the road and invited a group with four small children to climb aboard. Fourteen passengers fit with their belongings. Remember when I told the joke, how many passengers fit in a Mexican taxi? Yes, one more. I grabbed some food and water and took them to a shelter in Nayarit more than a hundred kilometers away. On the way back, along the road there were people walking, so I reached the initial point and invited others to get on the van. A 12-year-old boy was traveling alone. He was hungry. I gave him some food and then he fell asleep. I thought I had seen everything until a person asked me for food. We did not have more; then he ate the dregs. Again, on the way back alone, I was thinking about what was happening, I decided to make another trip. I found on the road a group with four small children and a teenager. It was getting dark and they quickly climbed into the van. A little girl was playing with my GPS phone. She told me, “It is the treasure map”; yes, the treasure maps took her to the treasure of shelter and food. I was overwhelmed and tired by what had happened, and happy for the opportunity to tell them about Jesus. This combination of emotions led me to remember the story of God taking care of Israel on the desert and of Jesus approaching people on his journey through Palestine. And this question is on my mind: Is Jesus the Christ of the migrants? Angel Infantes (Aberdeen) serves with his wife Blanca as part of the church planting team in the city of Guadalajara, Jalisco state, Mexico.